Houston - Houston rescue agencies were struggling to find beds Monday for tens of thousands of Texans driven from their homes by an unprecedented rainstorm that swamped America's fourth largest city. And -- as forecasters warned that Storm Harvey will regain strength and inundate the already devastated Gulf shore again by Wednesday -- neighboring Louisiana braced for the floods to come. 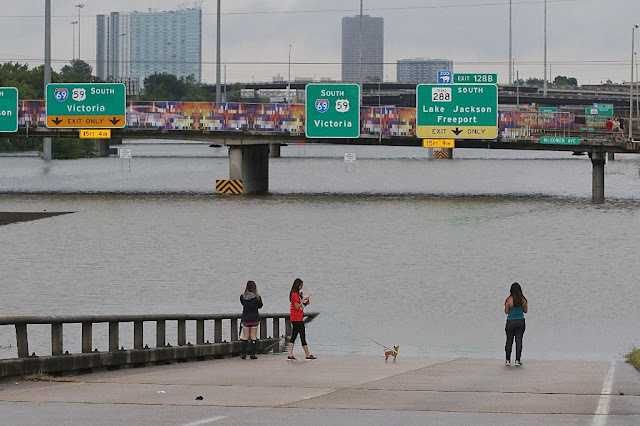 Roads are flooded, Houston's two airports have suspended commercial flights and two hospitals have been forced to evacuate their patients, while volunteers, rescue agencies and the National Guard battle to ferry beleaguered families from their homes. At least three people have died so far, with reports of other fatalities still unconfirmed, in what the National Hurricane Center called the biggest rainstorm on record, which crashed ashore late Friday as Hurricane Harvey. Harvey is now expected to swing back on itself and back over the warm waters of the Gulf on Mexico, sucking up another load of rain before doubling back midweek, on a deadly path back across Texas and Louisiana and deep into the US interior. Federal Emergency Management Agency (FEMA) administrator Brock Long said finding shelter for those flooded out of their homes would be his next priority. "We're anticipating over 30,000 people being placed in shelters temporarily to basically stabilize the situation and provide for their care," he said. "This is a landmark event. We have not seen an event like this. You could not dream this forecast up. You couldn't draw this situation up." President Donald Trump plans to go to the disaster zone on Tuesday. On Monday, he declared a federal state of emergency in Louisiana to match that in Texas and free up funds for relief and rescue. As of Monday morning, there were reports of five to six inches (12.7 to 15.2 centimeters) of rain per hour and unofficial reports of up to eight inches in a band of heavy rainfall. Overwhelmed emergency services warned residents to head for high ground or climb onto rooftops -- not into attics -- so they could be seen by rescue helicopters. More than 2,000 rescues had been made so far. Emergency 911 operators in Houston received 56,000 calls in a 15-hour span -- seven times more than in a usual full day. "We are going on fumes and our hearts ache for community we serve, but we will not stop!" said Houston police chief Art Acevedo. "The number of evacuees is increasing. 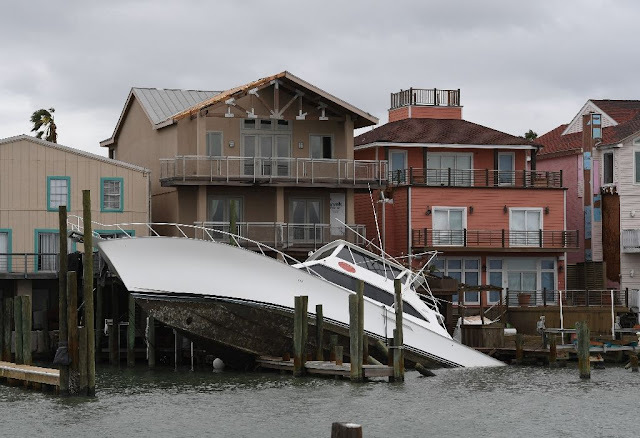 The number in harm's way will increase also with the rain that is forecast to come," Abbott said, adding that the storm had inflicted billions of dollars in damage. "The focus must be on life and safety," Trump wrote in a series of tweets about the disaster, his most serious domestic challenge since taking office in January. "The breadth and intensity of this rainfall are beyond anything experienced before," the National Weather Service said, as the storm spawned tornadoes and lashed east and central Texas with torrential rains. The NWS said that between June 1 and Sunday, Houston had received 46 inches (117 centimeters) of rain -- almost as much as it would expect in a year -- in only three months. 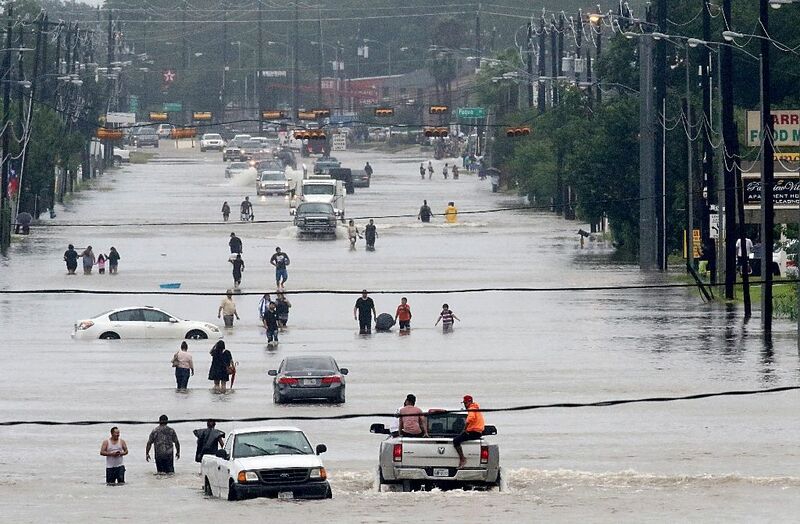 More than two feet (60 centimeters) of rain fell in Houston and nearby Galveston in a 24-hour period. Another 20 inches were expected. Flooding is expected to worsen as Harvey, the most powerful storm to hit the United States mainland since 2005, lingers over the area. Houston's George Bush Intercontinental Airport and Hobby International, the city's two airports, also stopped all commercial flights. However the hard-hit city of Corpus Christi reopened its airport Sunday afternoon. Thousands of National Guard troops joined local police and emergency workers to help with rescues in inundated areas of Houston. Boats also were being deployed, but more were needed. Harris County Judge Ed Emmett appealed to residents to use their own vessels. "I'm not even thinking about myself right now," Bryan Curtis, who came to Houston with his jet skis to rescue people, told AFP. "I'm here to help, I want to do my part." FEMA said there should be no illusions about the long-term impact of Harvey. Long told CNN it would take "years" to recover. ExxonMobil said Sunday it had closed its massive Baytown refining complex -- the second-largest in the country. US neighbors Mexico and Canada offered solidarity and aid. Mexico's foreign ministry said it offered help to deal with Harvey, "as good neighbors should always do in trying times." Prime Minister Justin Trudeau tweeted that Canadians "are keeping the people of Texas in our thoughts -- we're ready to offer any assistance needed to help recover from this disaster."